rrp £10.99, excellent reviews across the net, Amazon have just price matched Tesco's offer on this baby toy, as usual amazons price inc home del whereas Tesco's is del to store (will pop link to there in 1st post). 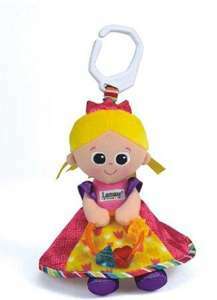 My girls had this lamaze toy & as with all lamaze baby toys it was fab quality & they loved it. Royalty never looked (or felt) so good! Princess Sophie holds her jewels (clacking beads) in her hands for baby to play with and her skirt crinkles to keep baby's interest. Her bold colours and contrast prints help with visual stimulation and development. High-contrast patterns stimulate vision. Crinkle for auditory development. Perfect for baby's first doll. Suitable from birth to 24 months. Love lamaze toys. Got one of these for my little girl at that price - thanks! They appear to have put the price up to £7.75 now though.